"Didn't have to have the drill! The dentist used a laser!" One of our lasers is called the Waterlase MD Dental Laser. This laser uses hydrokenetic energy (Er:YAG) for soft and hard tissue procedures. What this means for you is the Waterlase Laser can replace the drill or lesson the need for the drill in many procedures, removing much of the fear associated with visiting the dentist. For instance, the laser replaces the whine of the drill and generates no heat or vibration. Heat and vibration are the cause of most of the discomfort associated with the drill. Many procedures can now be performed without needles or with lessoned need for needles. 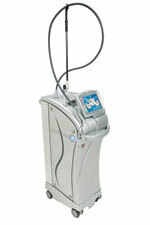 In addition, Dr. Melissa utilizes the Picasso Lite Laser. This is a soft tissue diode laser that can gently perform numerous gum treatments with little or no bleeding. When the laser is used, healing time is faster than with traditional gum therapy because the area is being decontaminated as it is being treated. The dental laser is a high tech instrument, useful for many procedures that previously required referral to a specialist. Ask Dr. Melissa today how the laser can be used in your mouth! Another laser we commonly use is the DIAGNOdent Cavity Detection Laser. DIAGNOdent is the revolutionary new way to find even the smallest areas of tooth decay. It is another tool we can use to find dental decay before the naked eye can "see" a problem or our explorer can "feel a stick." By using this technology Dr. Melissa is able to target and treat your problem areas before they turn into large issues that may require more complicated procedures. The DIAGNOdent is a completely painless laser used to detect pit and fissure cavities in the chewing surfaces of teeth. Its energy level is similar to that of a laser pointer; the laser beam is harmless to surrounding tissues.